My mom is part of an international women’s organization called Zonta which organized a big conference in Yokohama this summer. My mom was going as a delegate for her club in Sweden and my dad was going with her. Since they would be fairly close it seemed like a good opportunity for me and the wife to meet up with them for a few days, so we booked a couple of tickets to Yokohama. 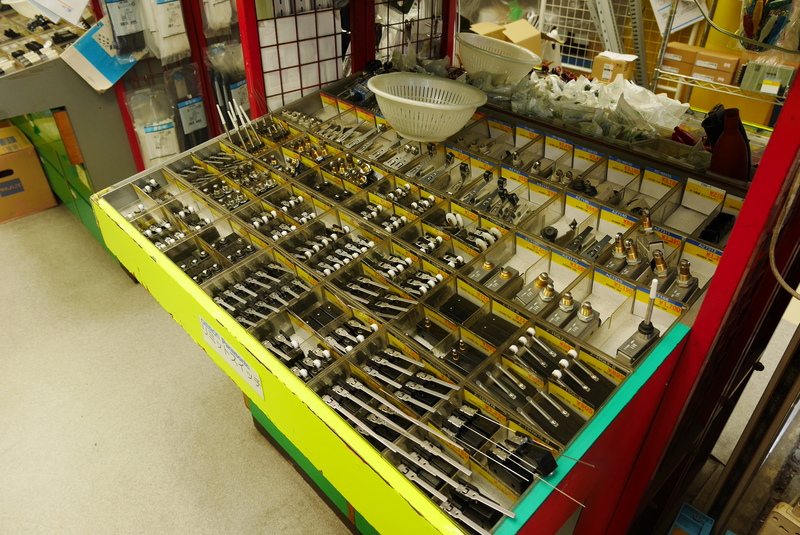 Although Yokohama is a pretty big city it’s not particularly well known for anything. Renegade Wife however did her homework and found out that the city houses a whole bunch of specialty museums. So while my mom was off doing important work for her club, me, my dad and my wife spent our days roaming around the city, checking out various museums and a few other interesting sights. Perhaps I should note that we had several more museums on the list that we missed because they are closed on Mondays and we didn’t have time to go back on Tuesday. 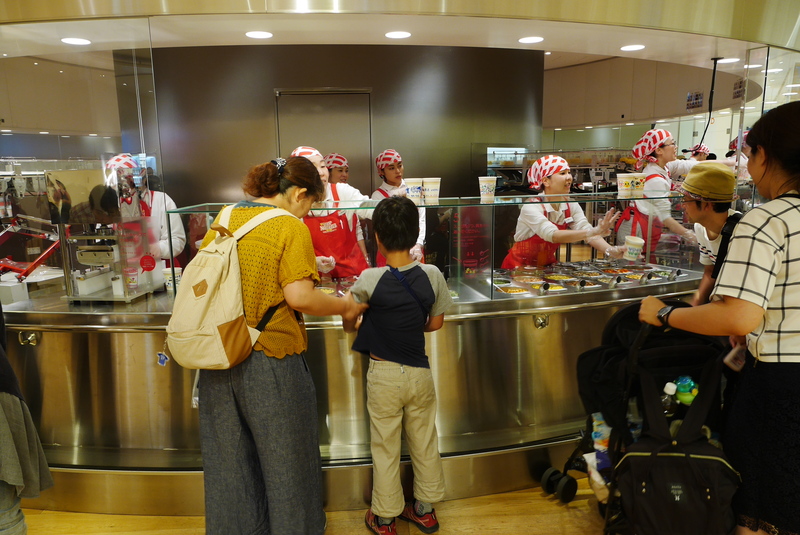 Before going to Yokohama I didn’t think the world needs a museum dedicated to instant noodles, but I was wrong. 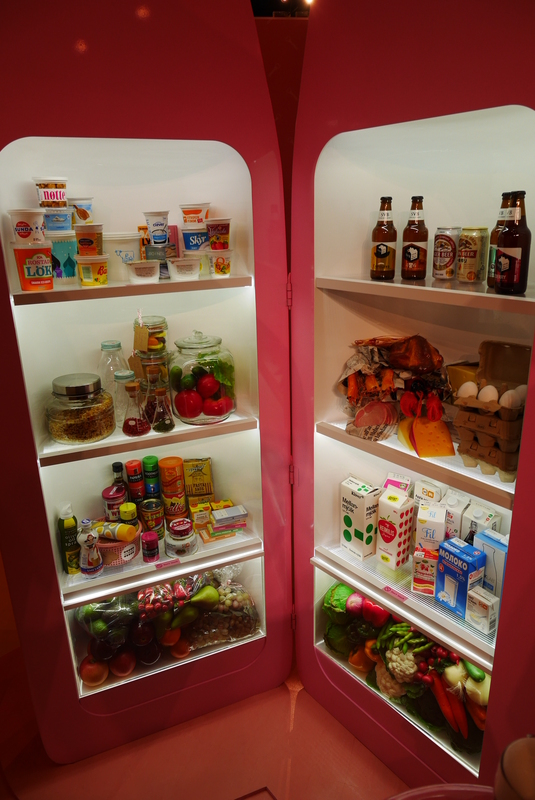 It turns out that a Cup Noodle museum is exactly what the world needs. 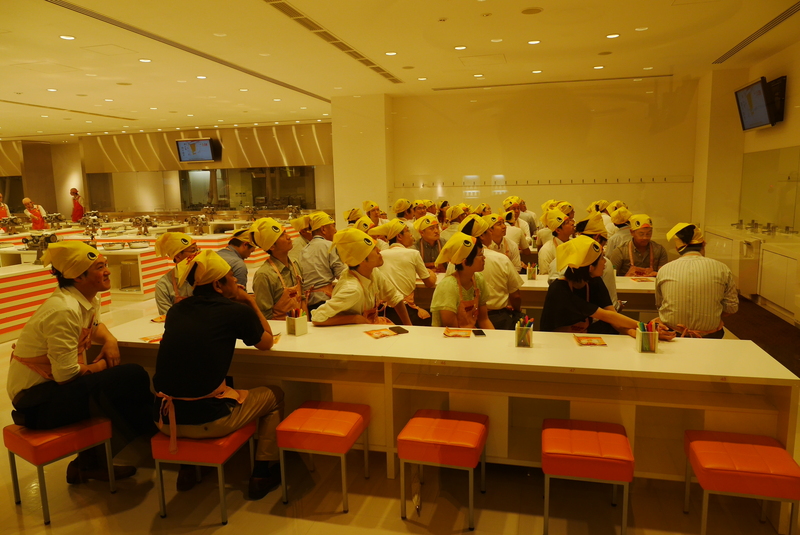 I exaggerate of course – I’m pretty sure the existence of a Cup Noodle museum doesn’t have any real impact on the world – but the thing is, it’s a much more interesting experience than I had imagined. It showcases the history of the company, the life of it’s founder, the various techniques used in the production and so on; all standard stuff for this kind of museum but I think the exhibition is well organized and informative, and there are some nice installations showing off the noodles. 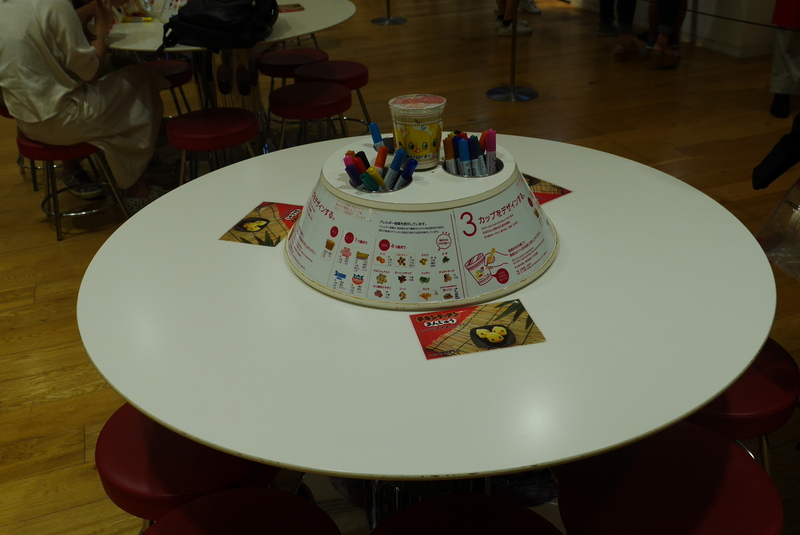 Beside the actual exhibition there is a Cup Noodle themed play area for children, and a hugely popular DIY area where you can make your own flavor of Cup Noodles and design your own cup. We never tried the DIY because you had to book a time when you bought the tickets but it looked pretty fun. 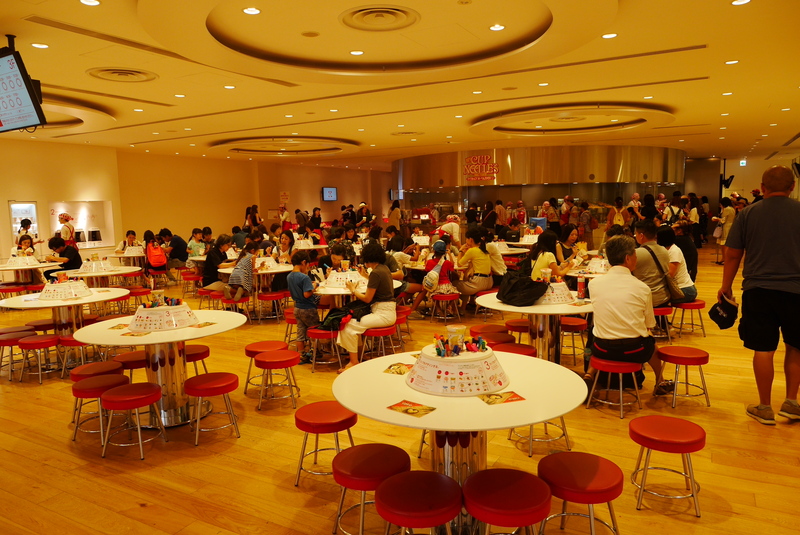 I wouldn’t say the cup noodle museum is super spectacular or anything but a decent way to spend a few hours. 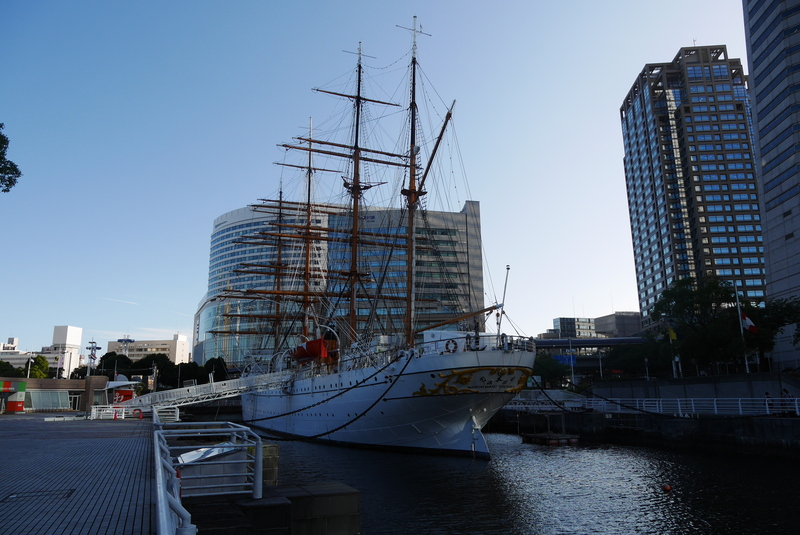 Yokohama is a major port city so naturally there is a museum showcasing the history of the port and how it has changed and grown over the years. The exhibitions mostly consists of pictures with descriptive texts alongside a smattering of scale models of boats and ships. The hands down best part of it is the ship simulator that allows you to pilot a vessel through a part of the harbor. 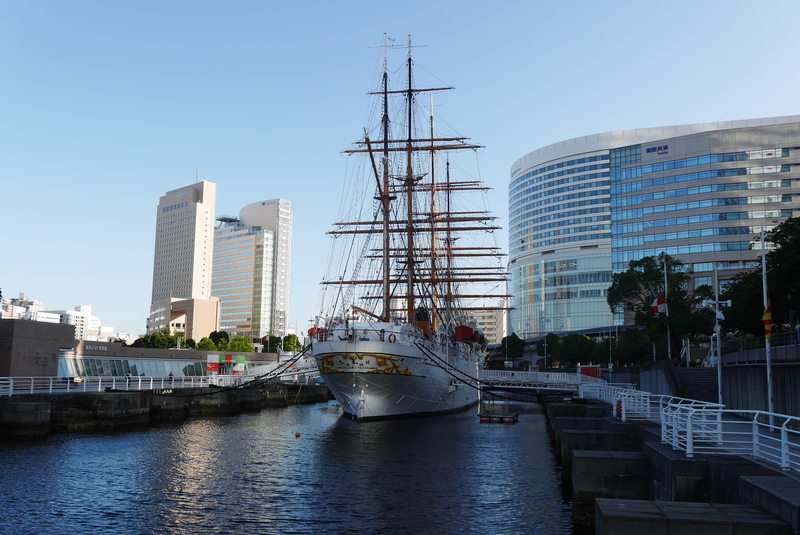 Right outside the museum lies the sail training ship Nippon Maru. It’s a beautiful four masted ship that looks very photogenic, you get an interesting contrast with the skyscrapers in the background too. You can go aboard the ship and look around but we skipped that for lack of time. I think the port museum is nothing special but you can visit it if you have time to kill. 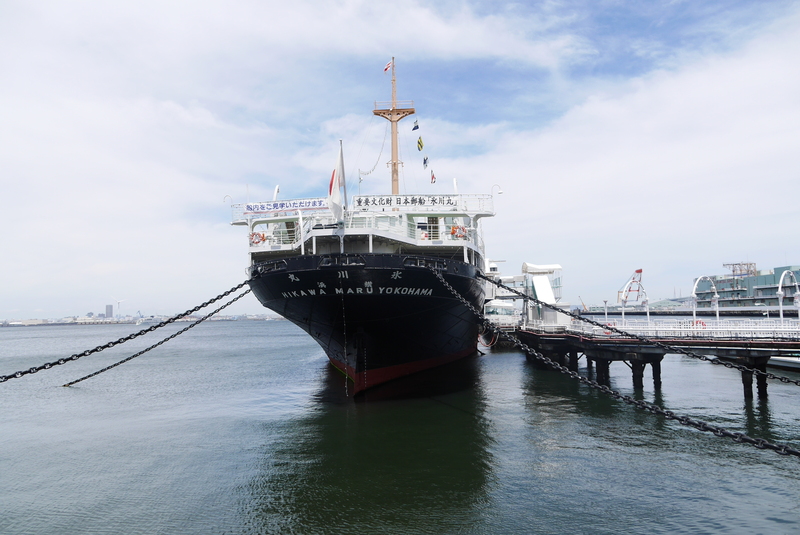 Nippon Maru is a very handsome ship like I said and it’s worth taking a look at. If you are really interested, going aboard is pretty cheap and probably nice. 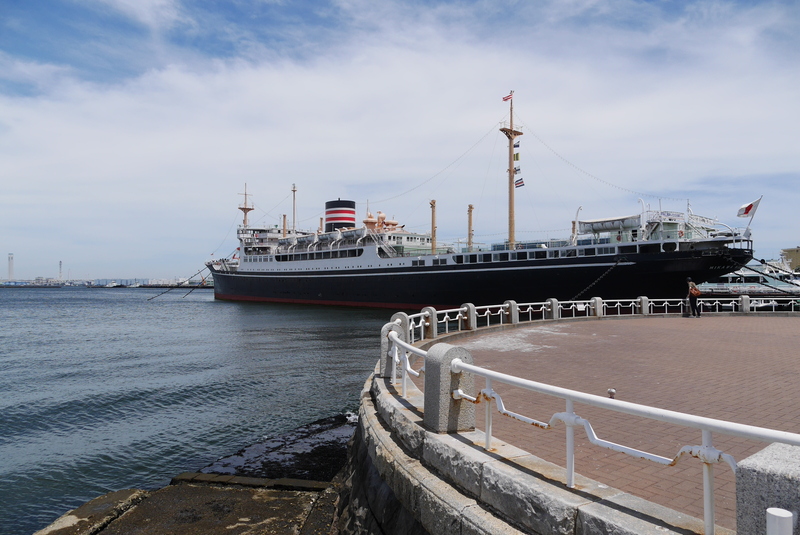 The Hikawamaru is an old ocean liner built in 1930 which ran the Yokohama – Seattle line. During the second world war it was converted into a hospital ship and later converted back to an ocean liner again. 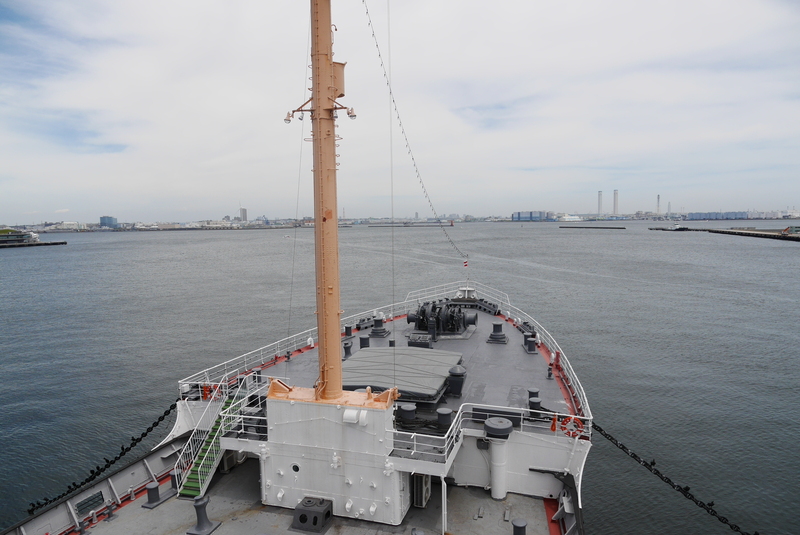 When it was decommissioned in the 60’s it was permanently berthed at Yamashita Park near downtown Yokohama and is now used as a museum ship. When you first go aboard there is a screen and couple of benches where you can watch a film explaining the ship’s history. 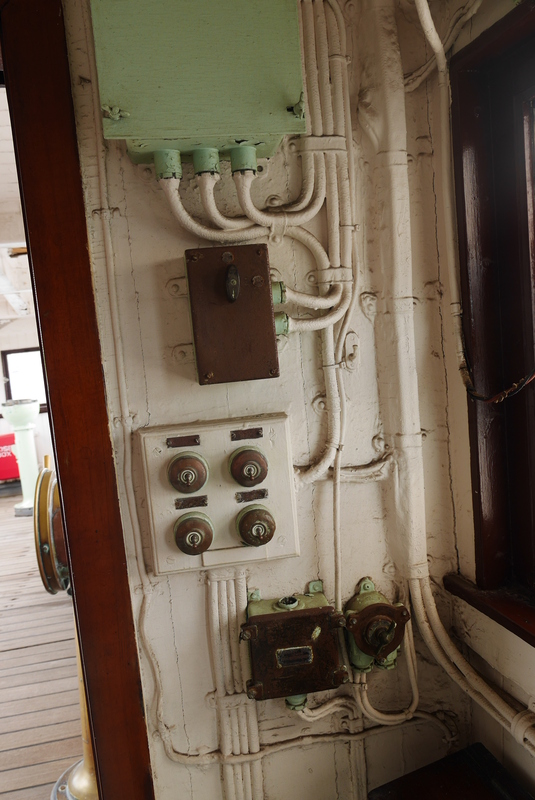 Other than that you are allowed to tour the ship in accordance with a set route, passing by passenger cabins, the restaurant, the smoking room, the library, the engine room and the wheelhouse. There’s not an overload of information and you’re not forced to take a guided tour or use an audio guide, as long as you follow the route you can do it at your own pace which I think is really good. I really like this kind of immersive museum where you can walk around in the actual thing and really take in the atmosphere instead of just looking at pictures and scale models. 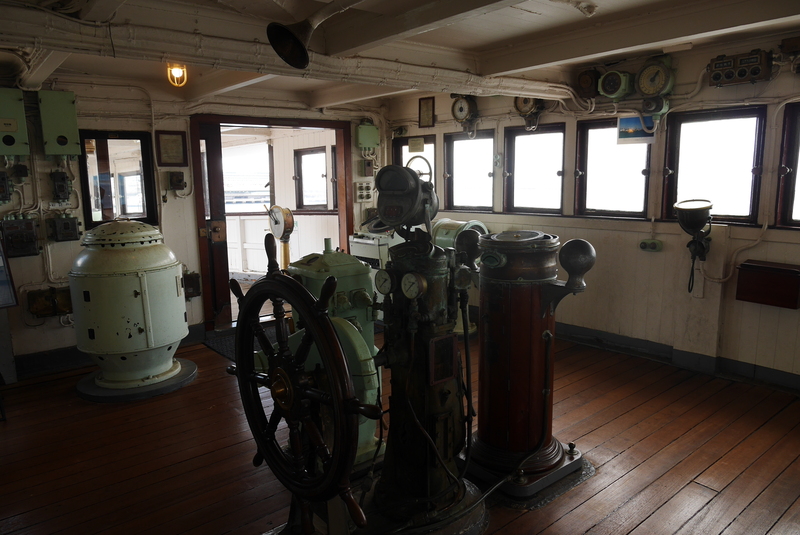 On top of that the Hikawamaru is a really beautiful old ship – kind of Titanicesque in style – and I’d recommended it to anyone with even a passing interest in maritime history. 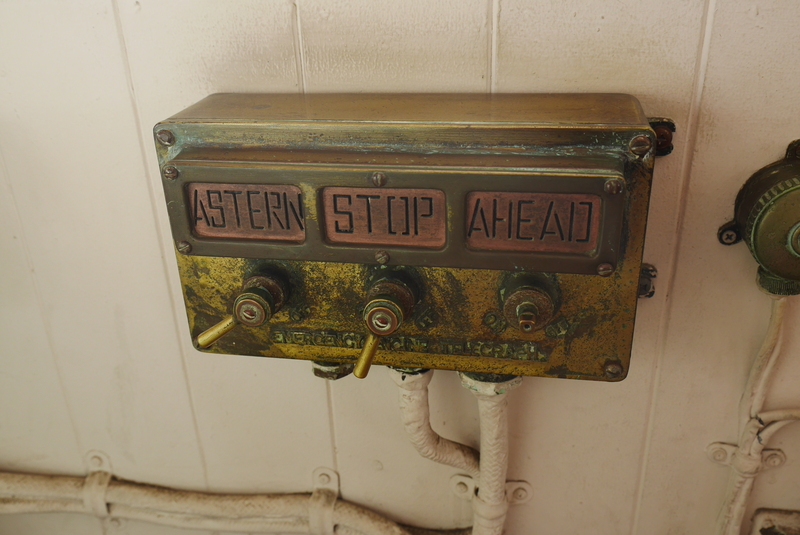 The coast guard museum is hands down the most interesting one that we visited. It’s a small free museum housing a single exhibition which just happens to be a super interesting one. Back in 2001 the Japanese coast guard spotted a suspicious vessel off the coast Kyushu in southern Japan. When they approach the ship ignored their orders and attempted to escape and even fired on the coast guard vessel with automatic weapons and even rocket launchers. The coast guard fired back in self defense and eventually the crew of the suspicious ship detonated an explosive and the ship sank. 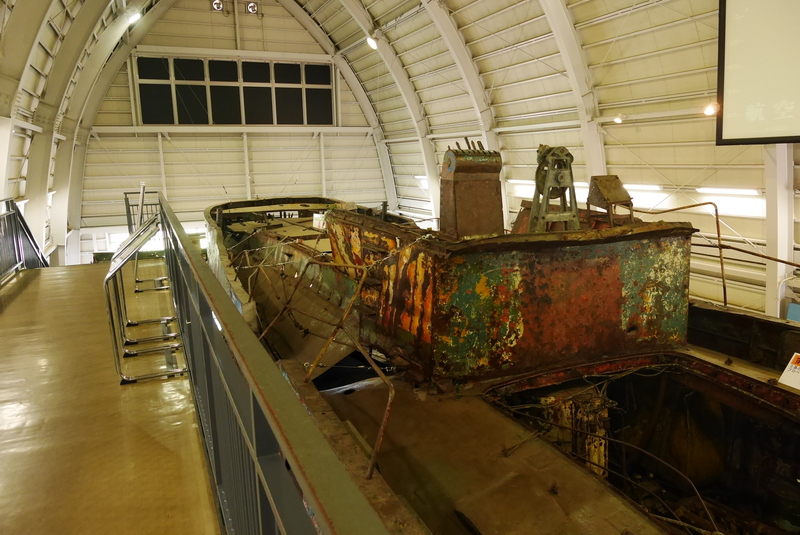 About a year later the Japanese recovered the ship to find out what it was. 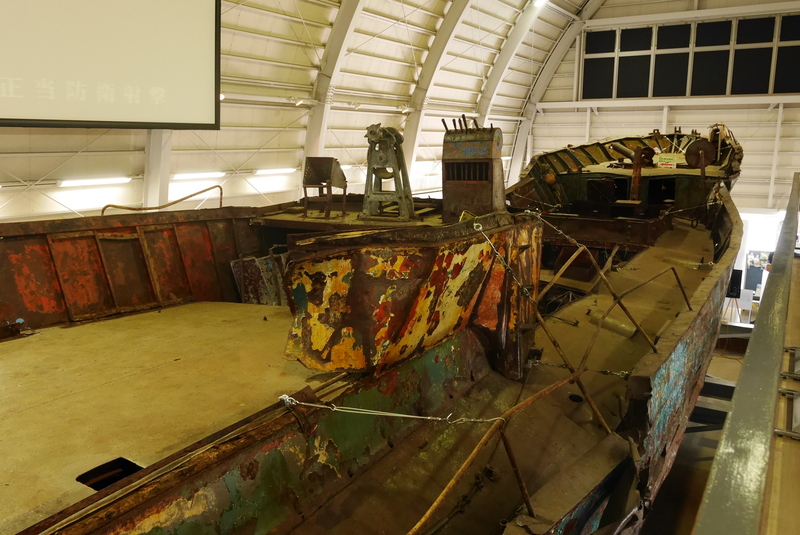 It turned out to be a north Korean spy ship which is now on exhibition in the coast guard museum. A spy ship is cool enough in itself but this one could have been taken directly from a James Bond movie. It had been built to look like a standard fishing boat but with about 10 times as much horsepower as one so it was fast. It had a recoilless canon disguised as a fishing net hoist in the front and dual machine guns hidden in a cabin at the back that could slide out on a track. So far so good, but the most extreme thing is that it had a set of doors in the back leading to a large compartment inside the ship. This compartment held a smaller boat inside which in turn was carrying diving equipment. Western powers use stealth technology and all kinds of fancy computer systems but the North Koreans simply take their inspiration from bad spy movies. I think it’s extremely cool. Like any good port city Yokohama used to have lots of big warehouses down by the port. Most of these are gone nowadays but two of them remain like they were in the 19th century, today they are simple called the Red Brick Warehouses. One of them houses a number of restaurant while the other has some shops on the ground floor and exhibition spaces on the two upper floors. 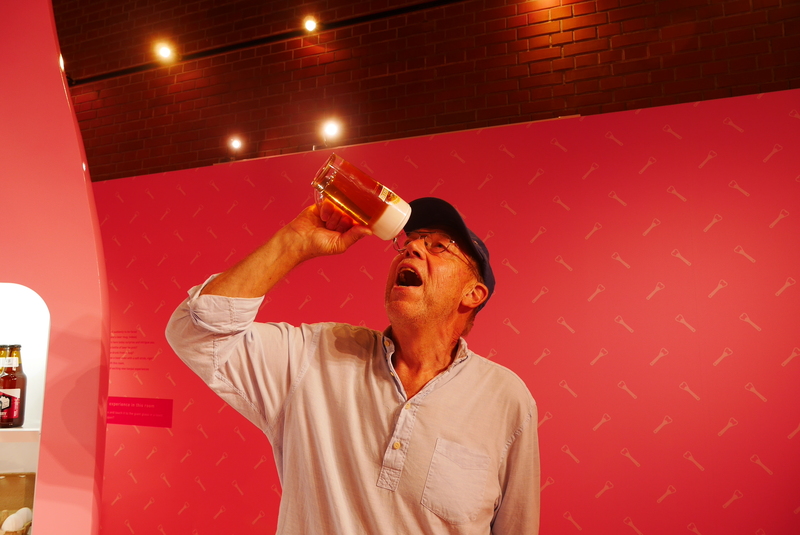 I can’t say for certain but I believe the exhibition is nonpermant; right now it’s about Kirin Beer and Japanese beer culture. 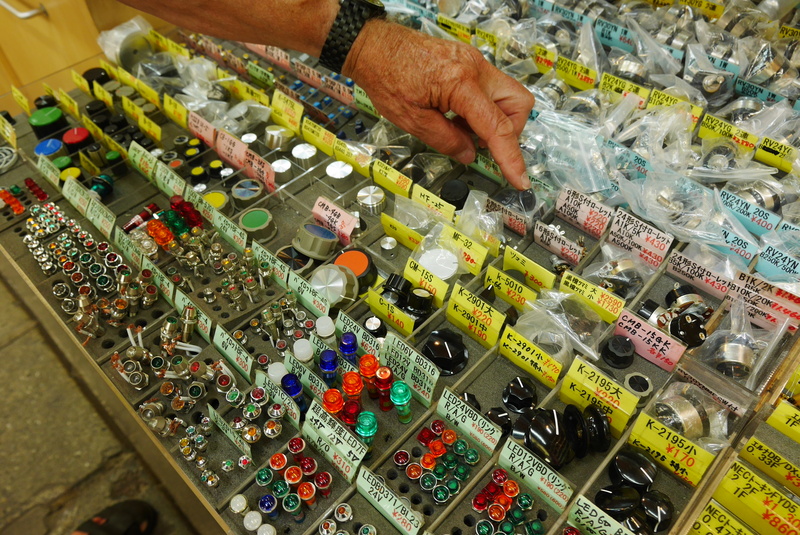 The shops and restaurants aren’t super special – there’s some good food, at least in the place we tried called Bills, and you can find some cool knick-knacks in the shops – but nothing really worth traveling far for. The buildings themselves do make a good landmark though. I think old style industrial buildings, especially red brick ones, are very charming and these are no exception. So if you’re touring the port, make sure stop by and snap a couple of photos and if you have to to kill you can go browsing the shops or check out whatever exhibition is there at the moment. 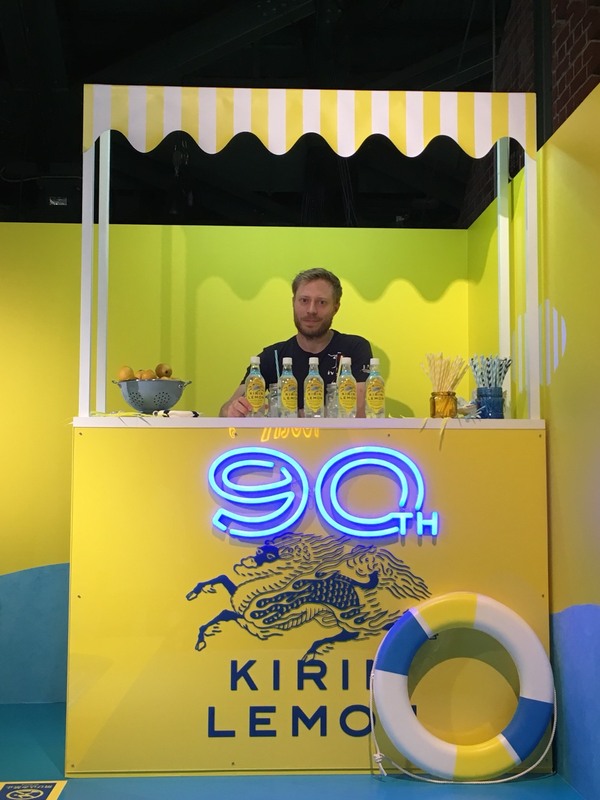 Some shots from the Kirin Beer exhibition on the top floor. 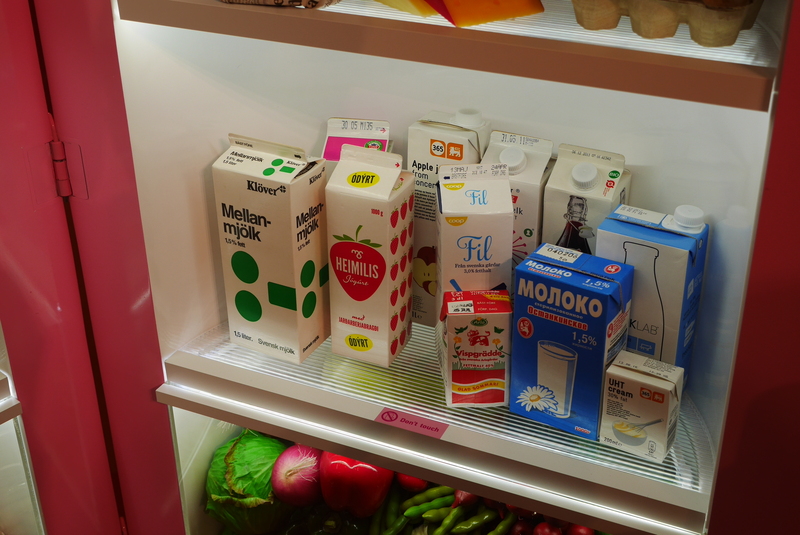 Note that the fake fridge contains plenty of products from Scandinavia for some reason. Though it feels slightly strange when China is just a short flight away, but Yokohama actually has a Chinatown. Apparently it’s one of the biggest in the world too. I’ve haven’t been to many other Chinatowns so I can’t say how this one compares but the streets do look distinctly Chinese in many ways and the place is jam packed with Chinese restaurants and fortune tellers; there are even a few Chinese style temples. We spent a little while strolling around in the streets and it’s very samey, just Chinese restaurant after Chinese restaurant. I believe it’s a good place to go get some food but otherwise it’s not that interesting. Though Tokyo and Yokohama are technically different cities they are so close together it’s hard to know where one ends and the other begins. That being the case, it is of course possible to commute between them within a reasonable time span. 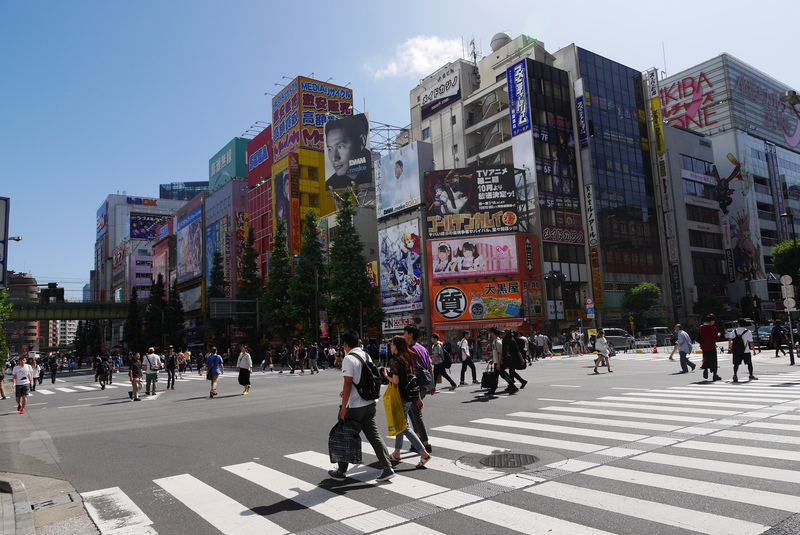 Because of ticket prices, Renegade Wife and I flew to Narita Airport on the east side of Tokyo and instead of spending a lot of time to go all the way to Yokohama in the south west, we decided to stay the first night in Tokyo. 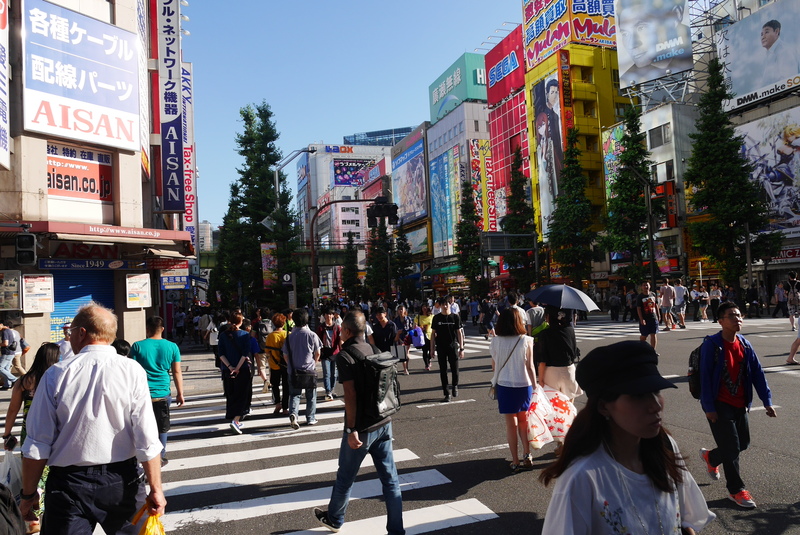 This meant that we had a chance to do something in Tokyo before moving down to Yokohama. 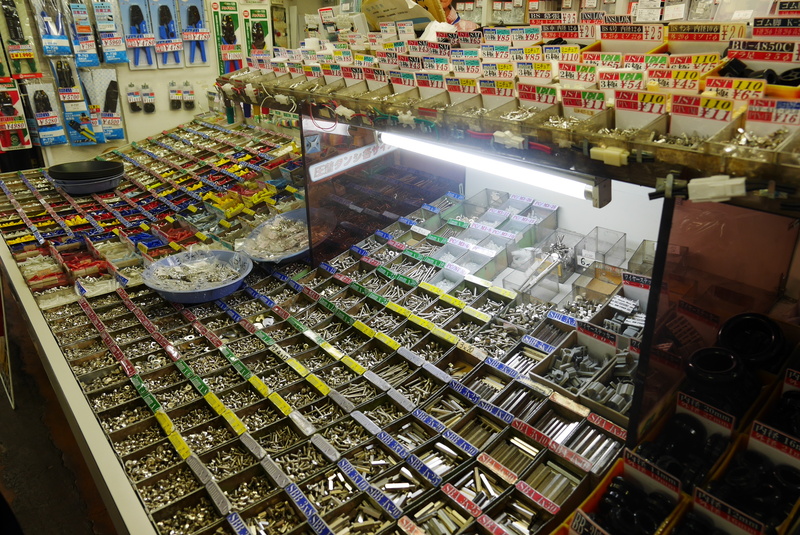 With both me and my dad being engineers the lot fell on Akihabara, also known as the Electronics Town. 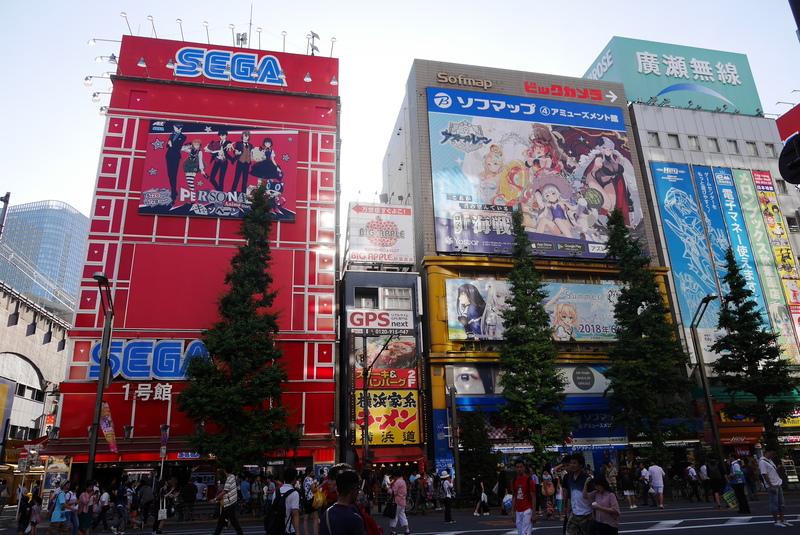 In case you don’t know, this place is a paradise for anyone who likes nerd culture of any kind, be it anime, manga, video games, electronics, action figures, movies or music. 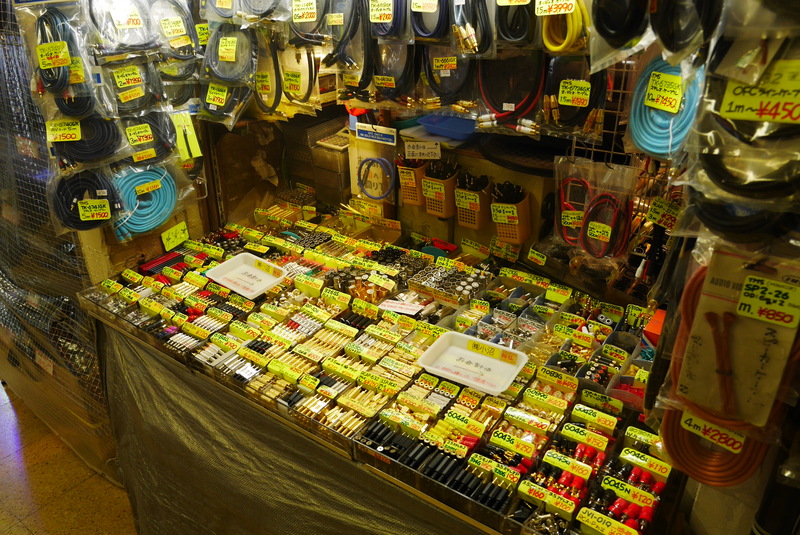 Right outside the subway station is a number of department stores full of this stuff and the entire area is decorated in brightly colored billboards and poster showing images from Japanese pop culture. 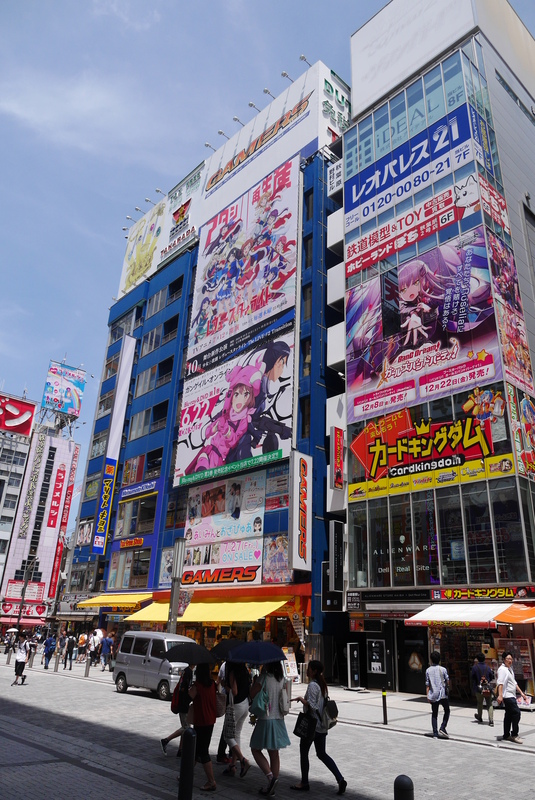 I’ve been in Tokyo three times and I’ve made a visit to Akihabara at least once every time. 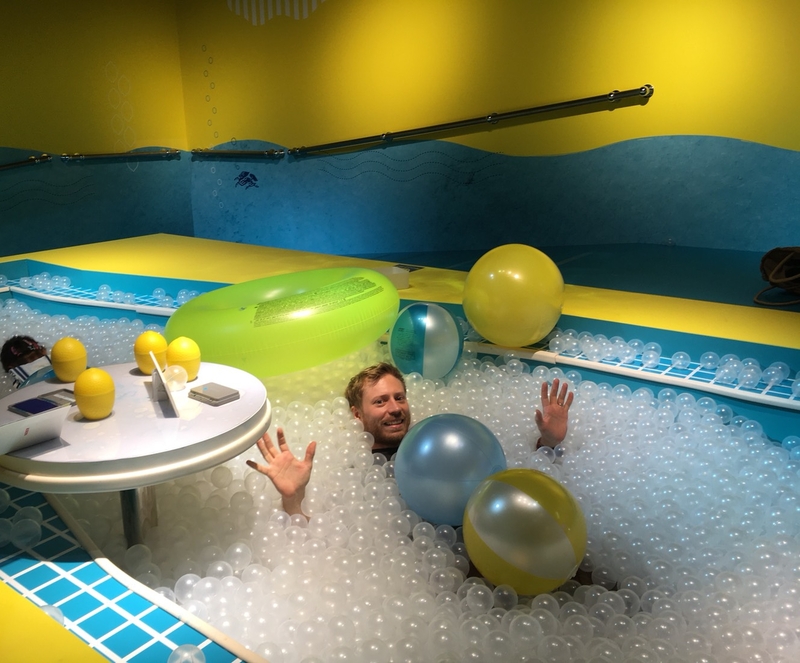 The place is absolutely wild and even if you are not interested in any of those nerdy pursuits, it’s well worth a visit just for the spectacle. 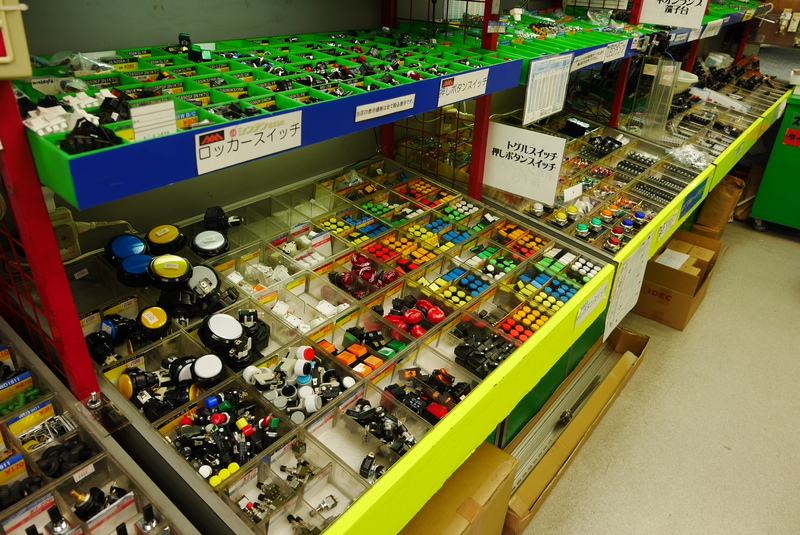 If you are doing a bit of hobby engineering the electronics bazaar is the place to go for buying parts. I’ve heard of these tours where they allow you to drive go-karts through the city but it’s cool to see one in real life. The main goal of this trip was for us to spend a bit of time with my parents and we have. Although we only got to see my mom in the evenings we’ve had some nice dinners together and I have spent a lot of time chatting with my dad while we were strolling around one museum or another. Renegade Wife and I really enjoyed meeting them and I believe they were very glad to see us too. As for Yokohama I think it’s a bit underwhelming. 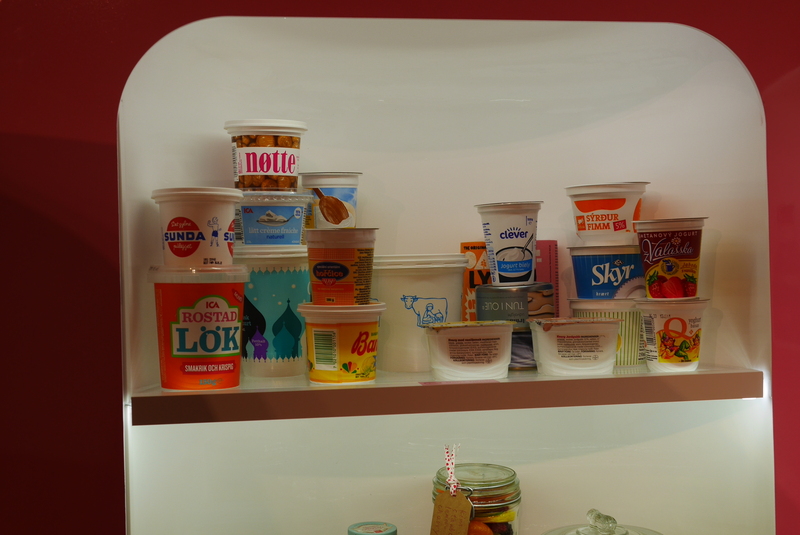 Sure, specialty museums, like the cup noodle museum, can be fun but in my opinion, unless they are super special, they are more a way for killing some time than than the real reason you go visit a city. Except for the museums and perhaps Chinatown, Yokohama seems strangely devoid of any major landmarks. 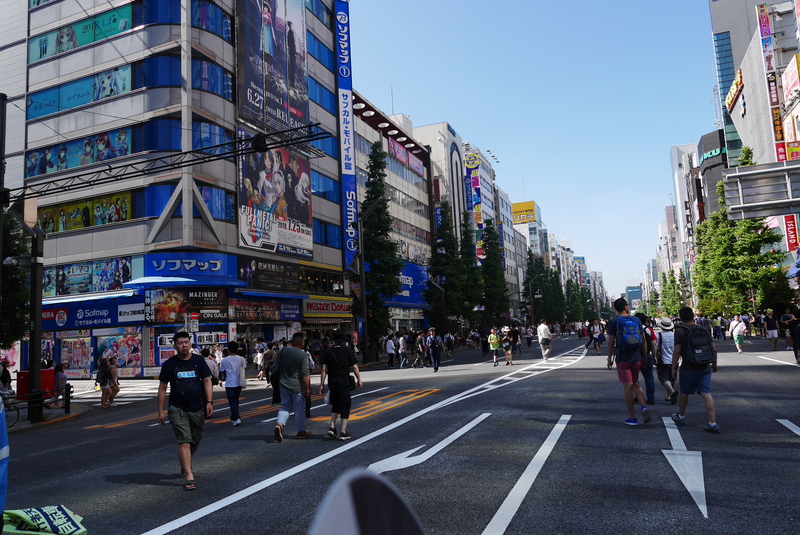 It doesn’t have that metropolitan vibe of Tokyo but it’s way too big to have that small town feel. Of the parts we saw there’s not much in the way of historical buildings except for the Red Brick Warehouses, and there aren’t exactly any spectacular landscapes to see either. The main draw of the city seems to be the massive convention center so if you are going to some kind of conference or convention in Japan, chances are it’s going to be here. 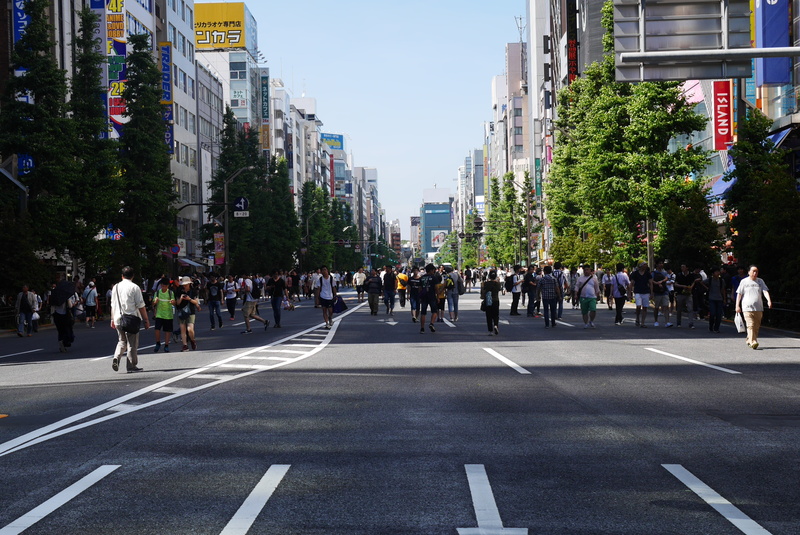 In that case you might go visit some of the museums, but considering the fairly short commute, you might as well spend your free time in Tokyo. There is also a silk museum and a kimono museum but we didn’t have time for those. That’s very cool actually!!! 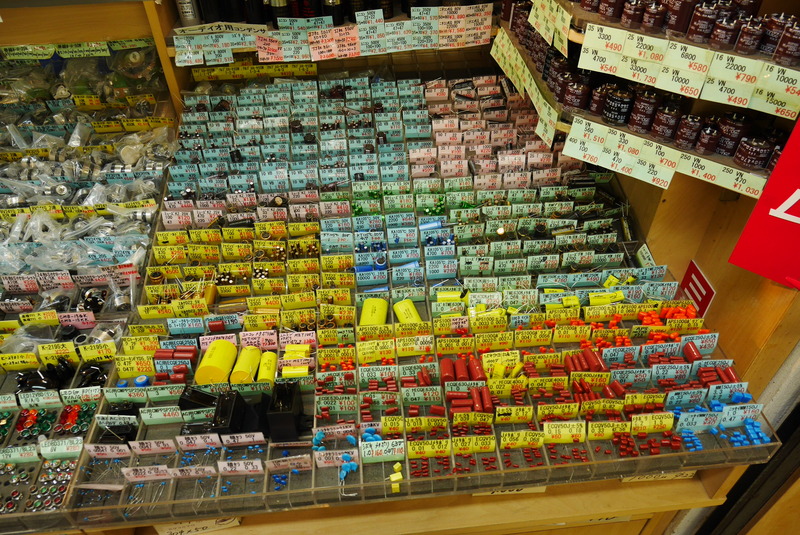 I need to go to Japan!! Go for it, Japan is an interesting place to visit. I also found it really funny to see people go karting in real life! I didn’t even know this was possible and couldn’t believe my eyes when I saw it… Thanks for all the reviews, we’ll definitely check out some of these museums in Yokohama soon!